Crossways Preserve lies in its peaceful, morning silence… until a white SUV pulls into the parking area, where already a Subaru is stationed. The amount and nature of stickers on each car is suggestive of potentially-obnoxious birders. Two women emerge from the SUV, both with a case of the morning stumbles, a third from the Subaru. Sleepy hellos are exchanged, followed by long-winded, we-have-to-carry-so-many-things-to-way-over-there sighs. One of the women places a thermos of iced coffee, with nonchalance, in the side pocket of her backpack (seemingly securely). A large and unwieldy plastic bin has been removed from the SUV and is sitting on the ground next to her feet, awaiting transport to a yonder field. She places said backpack on her shoulders, with said supposedly secure coffee thermos and bends, in total thoughtlessness, to pick up said bin. The iced coffee is released from its thermos imprisonment, to flow freely over her $6 Target tank top. 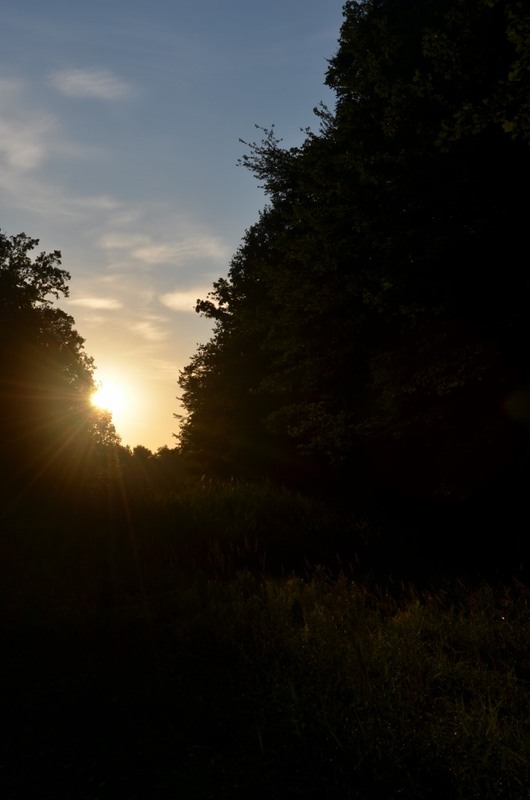 The sun breaks through the trees, and the day officially begins. But, as always, there were some pretty great highlights (including the fact that my tank top did not stain – yay!). 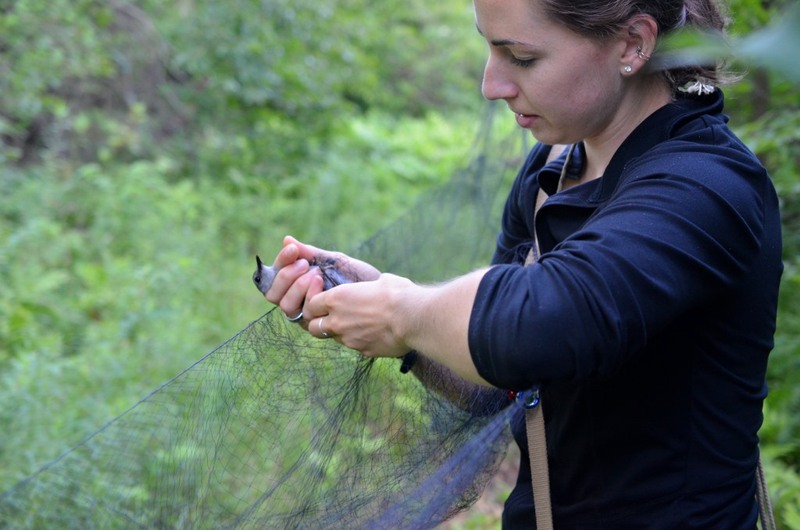 Like this catbird extraction action shot. 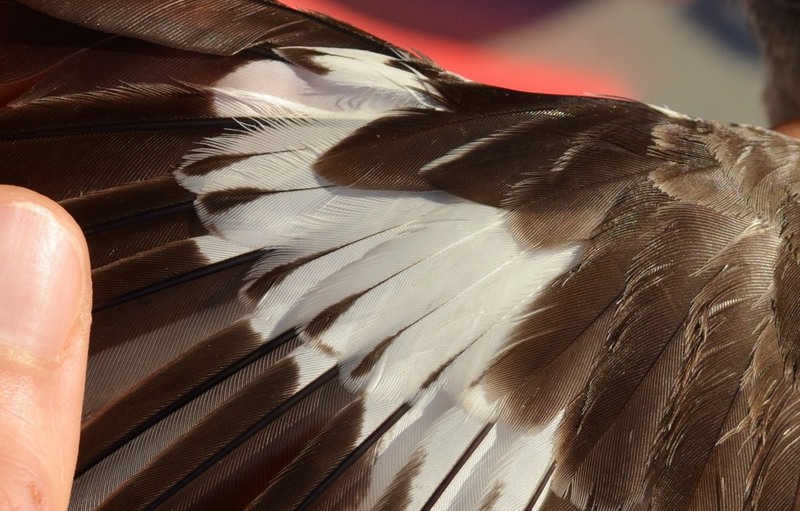 Take a look at this birds’ eye color – it’s a nice, deep brown. On a HY bird, the eye would be a more muddy, grayish shade. Not a lot is known about iris coloration in birds. It is determined by pigmentation and the refraction of light (much like feathers), which in turn is determined by changes in hormone levels and reproductive status (which makes it somewhat seasonal and tied to sexual cycles) and the bird’s age. For example, in Brown Pelicans (did I tell you we caught one of those back in June? …in my dreams? ), the iris of the male turns from a shade of dark brown, to a vibrant, gorgeous blue – a sign he is ready to have some little pelicans of his own. 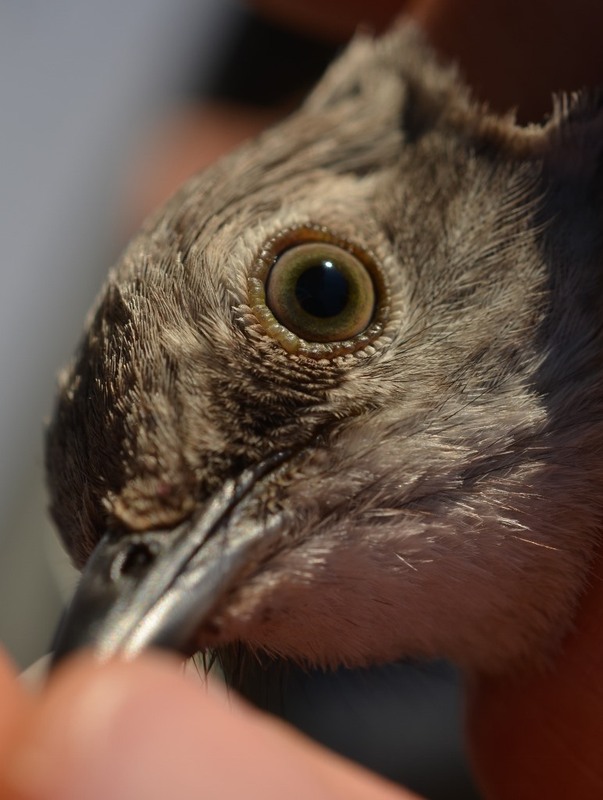 Sometimes eye color is entirely gender-dependant, too: in European Starlings, which are monomorphic – meaning males and females are visually identical – only the female’s iris has a yellow ring around it. 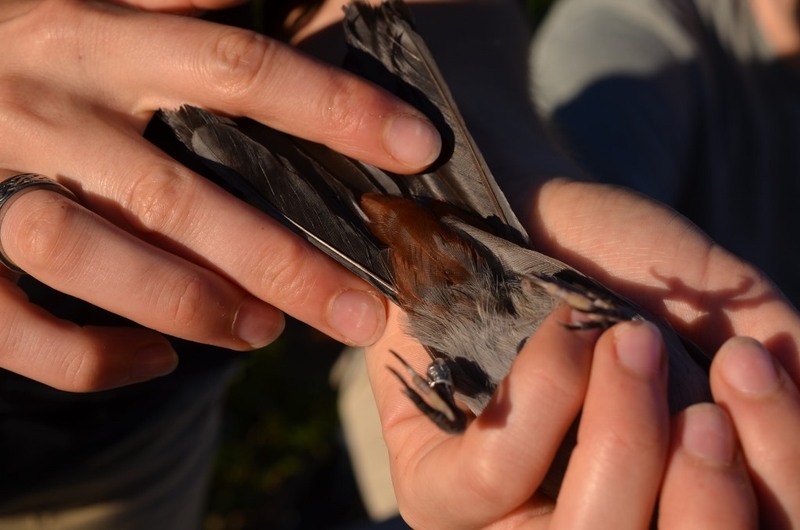 Which is only detectable, of course, on a bird in the hand (yet another example of the advantage of banding). So why a change in eye color with age? Why not just be born with the brown eyes of your parents, instead of weirdo gray ones? It seems that it’s likely one of the ways that birds can differentiate age groups within their species – and that helps when choosing a mate. Amazingly, I think there’s something I haven’t told you about Catbirds! 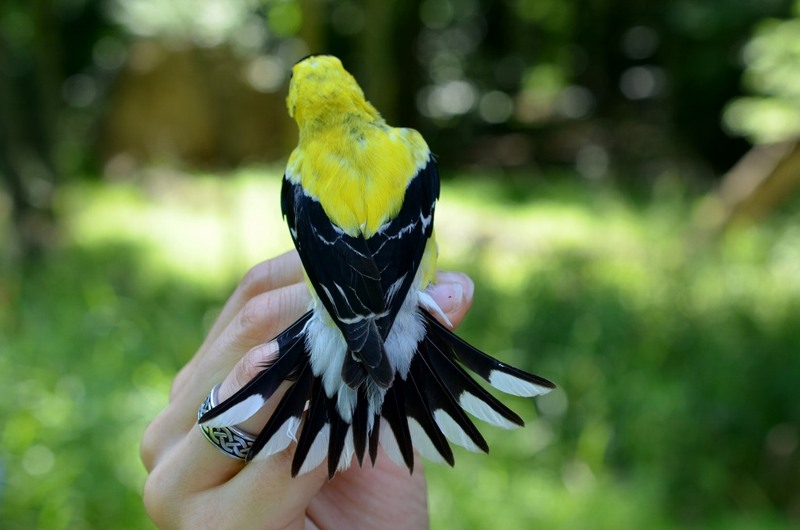 Which is that there is a huge amount of variation in the rustiness and coloration of their undertail coverts. 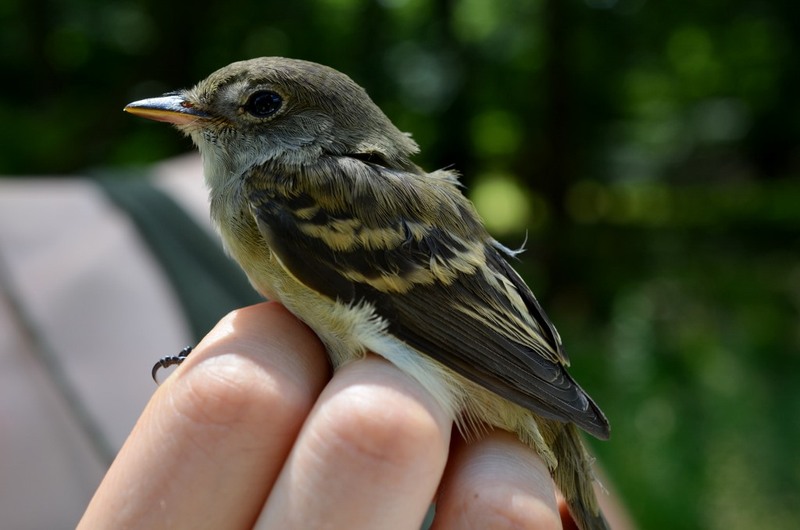 It’s possible that it relates to the age of the bird; some have observed that on HY/SY year birds, the undertail coverts have more gray mottling, while on AHY/ASY birds, they have more uniformly rusty coloring. Pictured here is an AHY, with not a whole lot of gray. 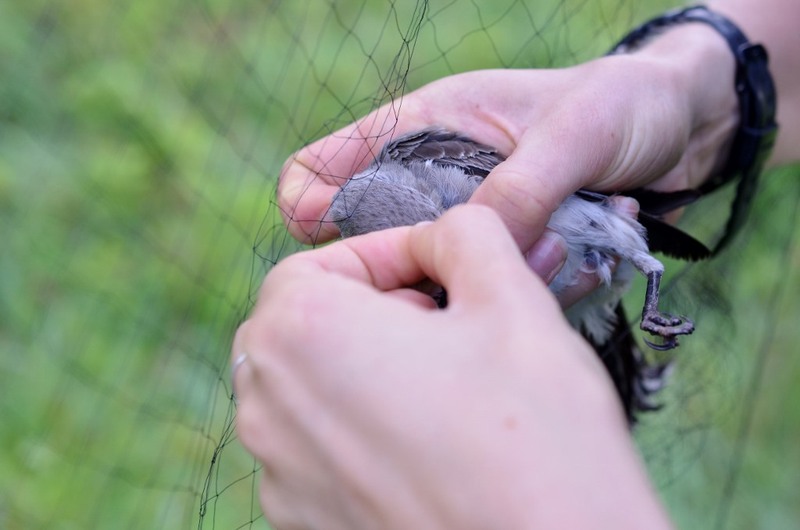 Let me just slip this net off your head, señor Mockingbird. Northern Mockingbirds are such cool birds. Watch them for a few minutes, and you will notice they have a lot of personality. Back in the day, they were caught and sold as cage birds, because of their repertoire of beautiful songs. They never stop adding to that repertroire, either, and can learn up to 200 (!) different songs in one lifetime (whereas I only know like 2 songs at any given time…). In the early 1800s, a good singer for sale in Philly could go for as much as 50 bucks. Sometimes Mockingbirds even sing into the night – typically, just the unpaired males – and they do so more often when there is a full moon. Their outstretched wings are pretty striking, but it can be hard to get a good look at this feature when the birds are in flight unless you can freeze time. 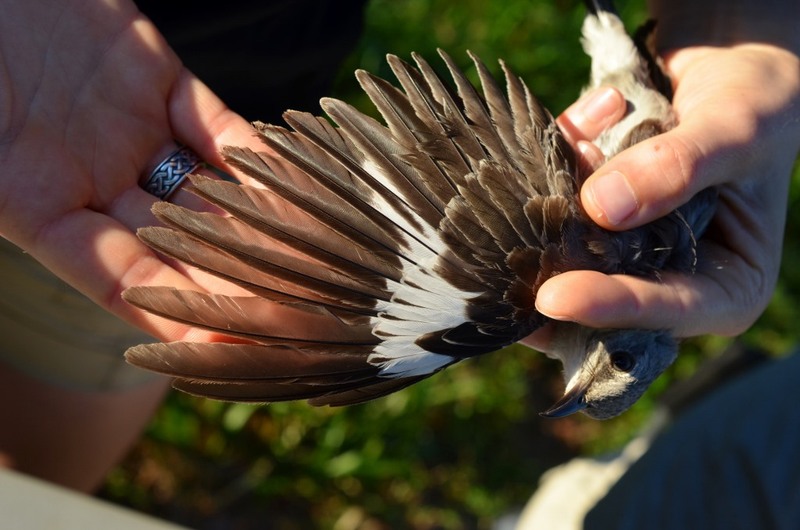 Mockingbirds sometimes flutter their wings, flashing the white patch pictured here. Though the reason for this behavior is not surely known, they may do it to startle insects, which they then catch mid-air. 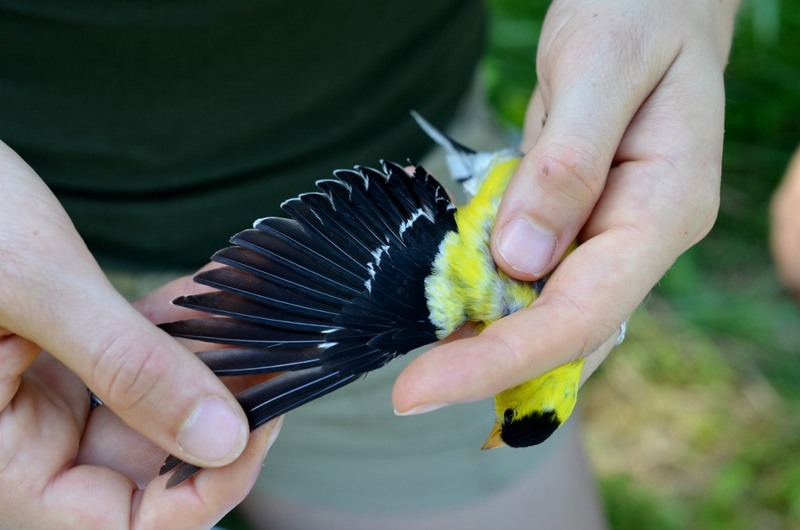 It’s at the point of the season where birds begin to do some confusing things, and for a lot of species, you can no longer say definitively if they are Second Year or After Second Year, because both age classes are replacing the same feathers. And so, lots of things become After Hatch Years – the catch-all for anything not born this season. So this bird was recorded as AHY, despite its eye looking a little on the younger side. 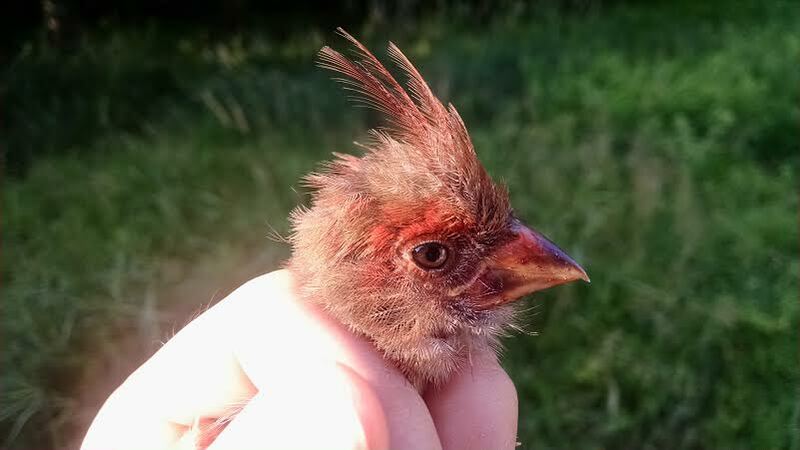 Pyle tells us that HY/SY birds have irises which are “grayish to greenish gray,” whereas AHY/ASYs have irises that are “greenish yellow to yellowish orange.” If you look at the very outer edge of this bird’s iris, it looks like it’s becoming a *little* more yellow. So while I had to call it an AHY based on other criteria, I’d possibly put money on SY, just because that yellow is only just beginning to show. Ok wow, you are probably getting sick of Mockingbirds. So I will move on. 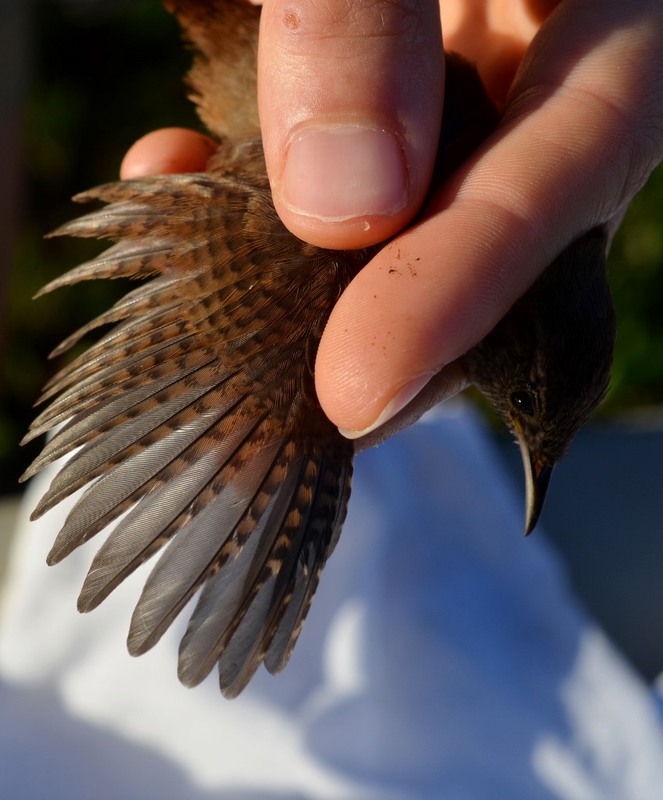 Here’s a lovely photo of a HY House Wren, with beautifully aligned wing bars. 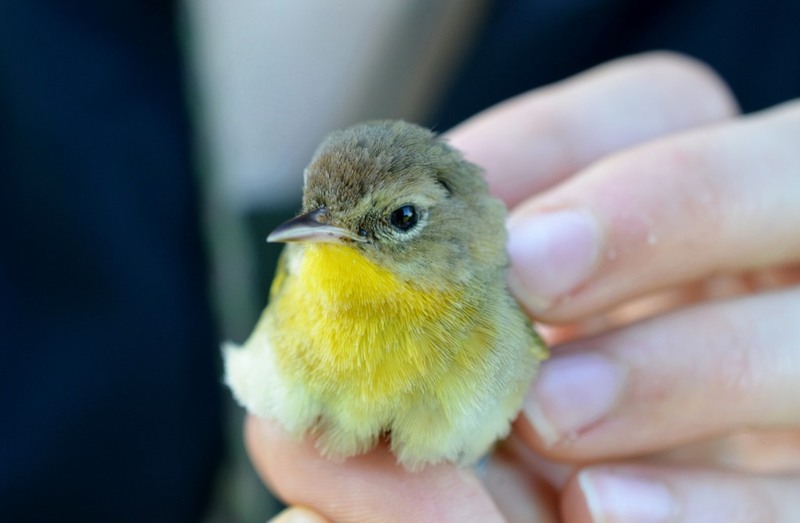 And a female Common Yellowthroat, who had quite the attitude. One day, a raccoon was teasing a wolf (they love to do this, you see) to the point where the wolf became so enraged that it began chasing the raccoon. Of course, being so clever and quick, the raccoon kept ahead of the wolf, and upon reaching a river, climbed up a tree to look down and watch what the wolf would do next. When the wolf got to the river, it saw the raccoon’s reflection in the water and jumped in, searching and searching in vain until the point of exhaustion; finally, it gave up and retreated to the river bank, where it fell into a deep, deep slumber. The sneaky raccoon came down the tree and while the wolf slept, covered its eyes with mud from the riverbank. When the wolf awoke hours later, it could not see and began to cry out for help, panicked. Just when it seemed no one would hear or answer his cries, a little brown bird appeared, and said to the wolf “I am but a small brown bird, but I will do what I can to help you.” And the wolf answered that in return for the bird’s kindness, he would bring him to a magical rock that flowed with red paint, and make him forever colorful. The bird cleared the wolf’s eyes, using his little feet to chip away the mud, and when he could see again, the wolf carried the bird on his back to the red-paint rock. There, the wolf snapped a twig from a nearby branch, chewed its end until it was like a soft paintbrush, and gently painted the small brown bird. And that is why to this day, cardinals are a beautiful shade of red. Ok, enough pipe dreams. Unto the next highlights! Eastern Wood-peewees: always peasant guests. Ahem. I obviously meant to type “pLeasant” up there, but I’m leaving that typo because I’m laughing too hard to fix it. 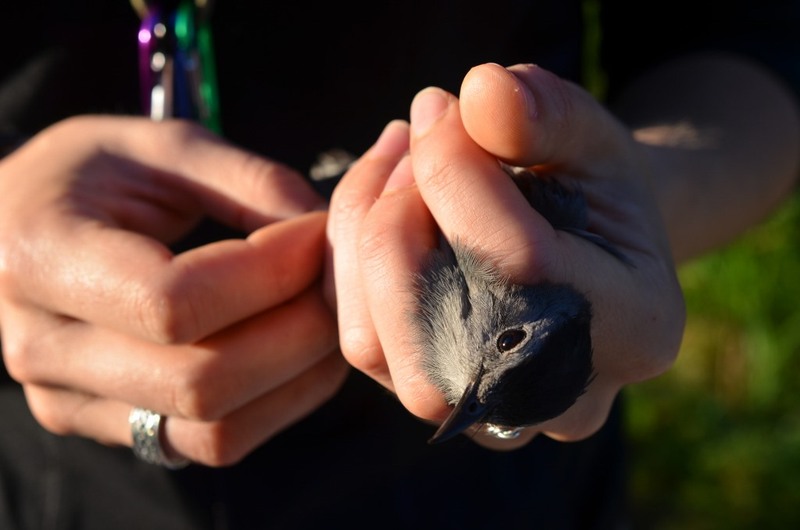 This species is particularly calm in the hand. Notice the darker area, on the underside of its bill, near the tip? That’s one nice characteristic for telling this species from other similar ones in the flycatcher family. This bird was so pretty… I have no captions for the pictures because I just am staring at them so hard. Alright I’m back. I can caption this one. 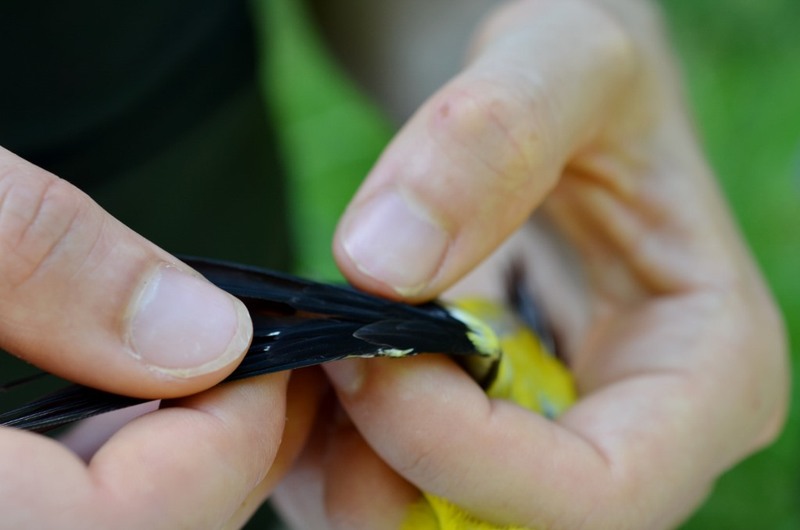 I think I’ve mentioned before that for Goldfinches, you can look at the carpal covert feather. 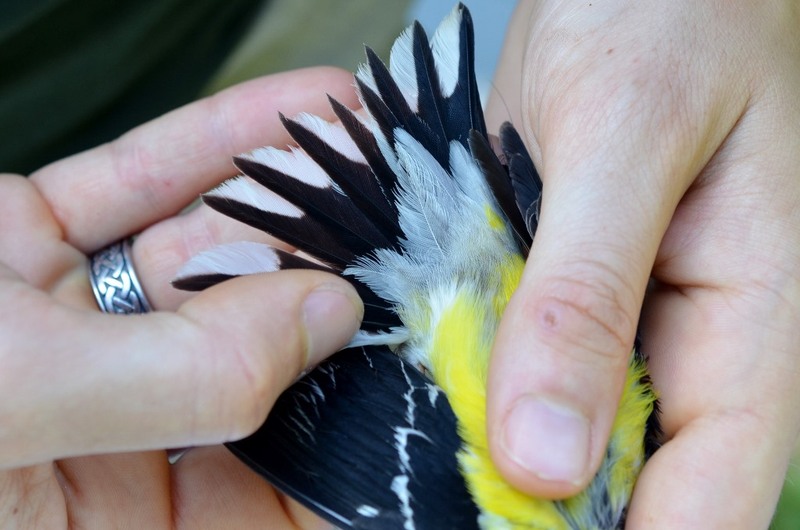 If that feather has a buffy tip, it’s indicative of an SY or HY bird; no tip, and it’s an ASY or AHY. This was definitely an ASY. No sir, not a buffy tip in sight. This bird’s tail feathers (retrices) are fairly blunt and squared off at the ends. 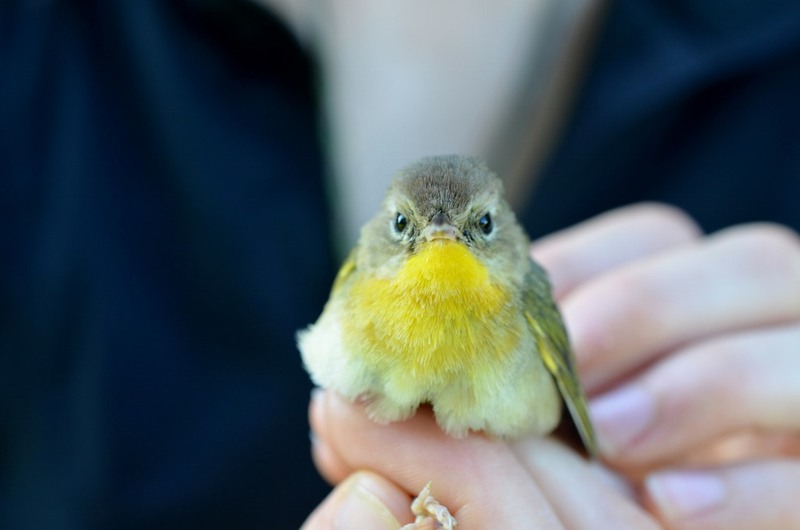 On a younger bird, they would be relatively pointed. The amount and brightness of the white on the tail is also another characteristic of an ASY bird, since HY and SY birds tend to have duller, more narrow, white patches. TIME FOR A GOLDFINCH SPIEL! 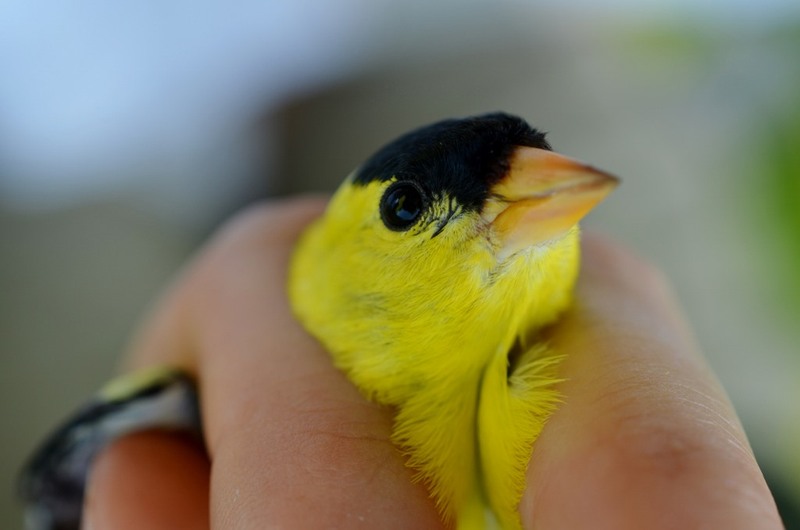 They are the state bird of New Jersey (and of Iowa and Washington… but more importantly New Jersey), and breed later in the summer than most birds; part of the reason for their late breeding is their choice of nesting material and the food they predominantly feed their young. 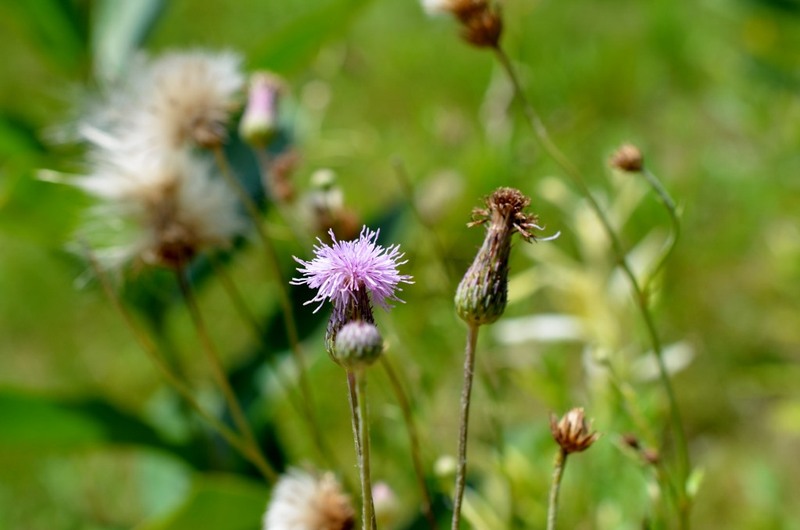 You see, later in the (typical) breeding season – say around late July, early August – thistle and milkweed are beginning to produce seeds, which have soft, thread-like fibers. It is these fibrous gems for which the Goldfinches patiently wait; they incorporate them into their nests, and feed the seeds to their growing young. 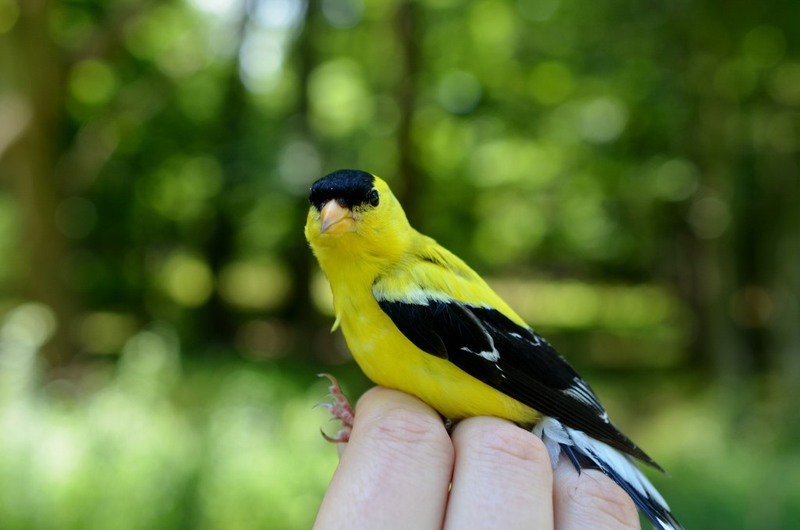 Actually, Goldfinches are vegetarians – one of only a few North American species that do not feed their nestlings insects, and live on essentially seed-only diets. And can I tell you a secret? They smell like maple syrup. And several people can back me up on it. 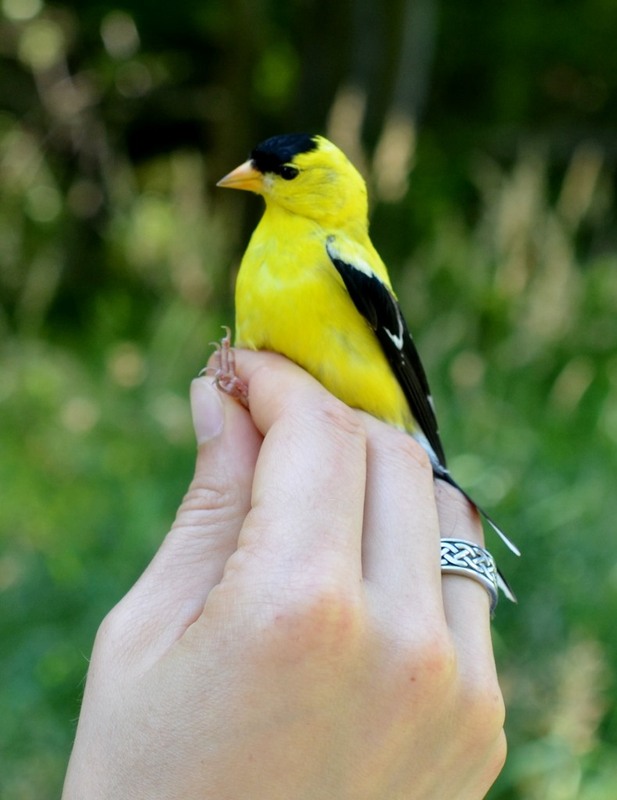 But anyway, here’s one more cool fact about them: Goldfinch pairs develop identical flight calls (isn’t that beautiful?). Which means they can tell other pairs apart, and who is with who, just by listening. A syrupy face, if ever there was one. Alright friends, that’s it for session 7. 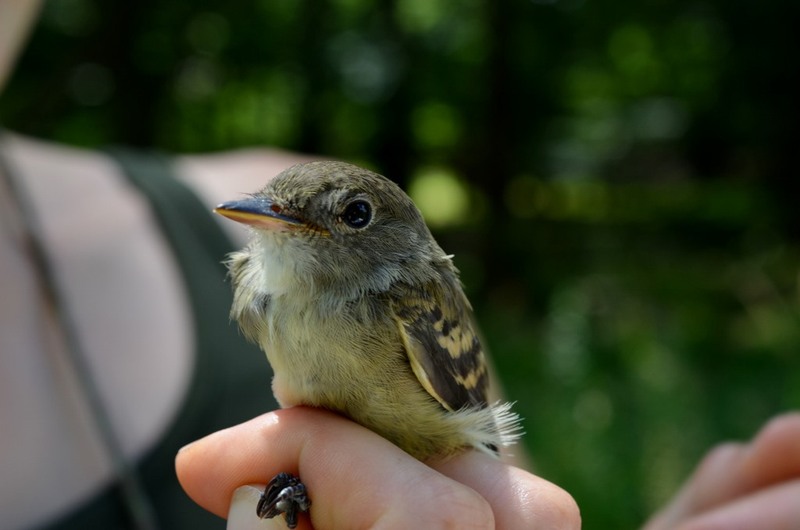 There was one last, final banding day after this one, so keep an eye out for those highlights! Canada Thistle (an invasive species… but those purple flowers ain’t too shabby).